Fifteen men on the dead man’s chest, drink and the devil had done for the rest. Charlie Short, a.k.a. 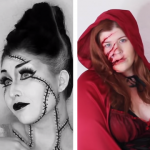 PinkStylist on YouTube, is back with another amazing Halloween makeup tutorial! This time, he’s created a unique character based on our undead ghost pirate costume. The tattered naval uniform looks like something right out of Davey Jones’ locker, and we absolutely love this take on it. Instead of a pirate eye patch, contact lenses black out an eye, and painted prosthetic pieces form a grim skull underneath the tri-corner hat. Hello! Okay, next tutorial. This time I’m dressed up as a rustic, skeleton pirate. I got this amazing costume from BuyCostumes.com and I really wanted to do something inspired by it. So, I hope you like my take on it, this kind of old rustic looking skeleton pirate. It’s just a fun one really. 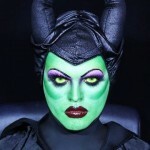 So if you would like to learn how to recreate this makeup, stay tuned. So, before I apply my bald cap, I just want to talk to you guys about the prosthetics I’m going to be using. A couple months ago I came across a company that sells foam latex prosthetics and there just the most beautiful pieces ever. They’re motionpicturefx.com, I’ll pop the link here. I came across them a couple months ago and I used the pieces for my Necromancer tutorial which I’ll pop the link on the screen for somewhere here. I just kind of fell in love with their pieces; they’re stunning. I’m not necessarily a fan of buying pieces already made usually because I like making my own stuff, but having said that when I saw these pieces they looked too good to be true. When I got them they really are that amazing and I’ll show you the piece I will be using now, which is the skull prosthetic. Isn’t it awesome? I’m going to be cutting the teeth out so I can actually talk and articulate with it but they are just beautiful pieces. The edges are incredible and as you can see how thin they are. Before I apply my prosthetic I’m going to apply a plain latex bald cap so I’ll pop a link on the screen here to a tutorial where I teach you guys how to apply a bald cap. Just so I don’t have to recap it in this video to make things go a bit quicker. So I’m going to apply my bald cap and I’ll get back to you. Make sure to cover your ears as well because I think the skeleton ears out will look a bit weird. There we are! So after I apply my bald cap, I’m going around the edge with Liquid Latex. It didn’t matter too much here cause the piece pretty much covers that. But I went over the areas with 3 to 4 layers of Liquid Latex just to blend the seam. Then I’m going to take some Pro Stick and I’m going to take my Prosthetic and apply Pro Stick all to the back of my pieces. Just so that it dries and has a nice barrier built up. Then taking a new cotton ball and some small Pro Stick, I’m just going to really lightly brush over the edge all around this piece. So work really slowly rolling the glue away from the piece. Then while that’s drying I’m going to do exactly the same method using the bottom of the prosthetic. So there we are! So now onto the foundation. The palette I’m going to be using is a Life Colour Palette. It’s one of New Gold Tones Alkali Fade Palette similar to the skin illustrated Palettes. And the idea is I’m going to use a mixture of the Peaches and Browns to speckle the color on over the piece. So just speckle the color, don’t worry about doing like a block of color, just speckle it in random areas and then you can go in-between with other colors just to really add a nice texture in. If you are using this Palette I’m using a mixture of Sandstone and Light Chestnut just to speckle in between. So where the hollows are, I’m using the Dark Chestnut and around the mouth area the rest of it is going to be the Sandstone color. Then while that base is drying I’m going to take a M.A.C. Black Chromacake water color and I’m going to apply that all to the outside of this bald cap. I was going to originally paint the entire skull, but I would much rather have this peering out in the shadows. So I’m going to stop the color about here so I can have this skull color and then fade it off into the black, but I want a block of black color there. Plus, I’m going to be having a hat on as well so a lot of this is going to be covered, but I do want the rest of this to be peering out in the shadows. So I’m just going to brush this towards the center of the face. Then I’m going to take a Makeup Forever Flash Palette, and I’m going to use the Black from that Palette, which is like a really nice thick cream. We’ll apply that all around the edge, where I fill the black here, and I’m going to blend that towards the center of the face so that there’s no harsh edge. Okie dokie, so as I said I’m not going to focus too much on this area because the hat that I’m going to be using actually covers most of that. So I’m not going to focus on there really so now that I’ve done that I’m going to work on covering the insides of the eyes and the mouth. Taking my Makeup Forever Flash Palette I’m going to use the Black from that and I’m going to cover the inside of the mouth and the eye sockets. The reason I’m using a cream is because it just makes things look a lot deeper when it reflects the shine back. It’s a really nice way to work in depth. For the teeth I’m going to take the Alkaline Fade Palette again and I’m going to use the really light color which is the Sandstone, and I’m going to apply that in a block cover just over the teeth. Then I’m going to take the brown from that palette which is the Chestnut Color and I’m going to use that to go around the edges and in between each tooth just sweeping it towards the middle. Then I’m going to start adding some extra shadows in so I’m going to blend around the edge without adding any extra color just taking a Fluffy Brush. I’m going to blend the black just ever so slightly about a half centimeter towards the outside same with this as well. I’m just going to blend these a little bit towards the center of the face and everything goes outwards just so that it looks like its peeking through rather than a block of color. So I went completely off on a tangent here. I started blending the black out and then I realized it gave this really cool grey scale effect with the fleshy tone and it just looked really cool I think, so I think I’m going to extend that across the face. I kind of like it. So all I’ve actually done was I’ve taken a tiny bit of water and I’m blending the cream outwards without adding any extra black cream. I really like the grey scale of it and it kind of does go with the costume. Then I will take the black crème again (Makeup Forever Flash Palette) and I’ll just go in the hollow areas of the skull and I’m just going to do one line going across and then sweep the color downwards just so that it looks like a shadow. Also going to go down the hollows in-between each tooth, so I’m going to spike the Black Crème downwards and upwards in-between each area so it trail off. Ill also use the Black again just to go in the areas where there are cracks built into the prosthetic just to really highlight them. Then just going to take the M.A.C Black Chromacake Water Color and I’m going to pain the rest of my neck. Then just for laugh I’m going to take some Graftobian Powdered Metal in Gold and I’m going to mix that with some Magic Set Fluid by Graftobian and it makes like a really light liquid gold it’s gorgeous, and I’m going to apply that onto one of my teeth just to make it a bit more pirate-y I think haha. Isn’t that nice haha I really love the powder by Groftobian it’s gorgeous. Then I’m just going to pop in my contact lenses, my costume and we’ll see where we go. And there we go, that’s the look complete! I finished the look off by popping in sclera contact lenses. One is completely blacked out and one has got the white in the center. I just thought it was a cool take on an eye patch, so I got one bad eye and one sort of good eye. The costume is like a zombie, skeleton, pirate costume, which I got from BuyCostumes.com. 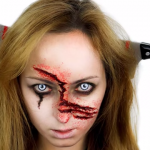 It’s really what inspired this makeup because it’s such a cool idea. I love the hands! And I thought I’d make a change from doing like a generic grim reaper. I thought it might be a bit more fun to give it more character, more of a twist. 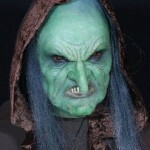 Definitely check out motionpicturefx.com I’ll pop the link again there cause these prosthetics are amazing. I’ll also pop the website directly to rbfx.com there as well just in case. So yeah that’s my rustic looking skeleton pirate makeup I really hope you guys enjoyed it.